How do I properly setup Email-Ticket Management so all my customer-company email communications are organized in the Operator Panel? The Email-to-ticket feature in the ticketing system organizes your customer emails by converting all customer email communications into a queue of organized, prioritized and assigned inquiries. With email-to-ticket, you will know exactly when an inquiry was received, who is working on it, the full history of customer and agent comments and the full lifecycle of the inquiry from opening to resolution. 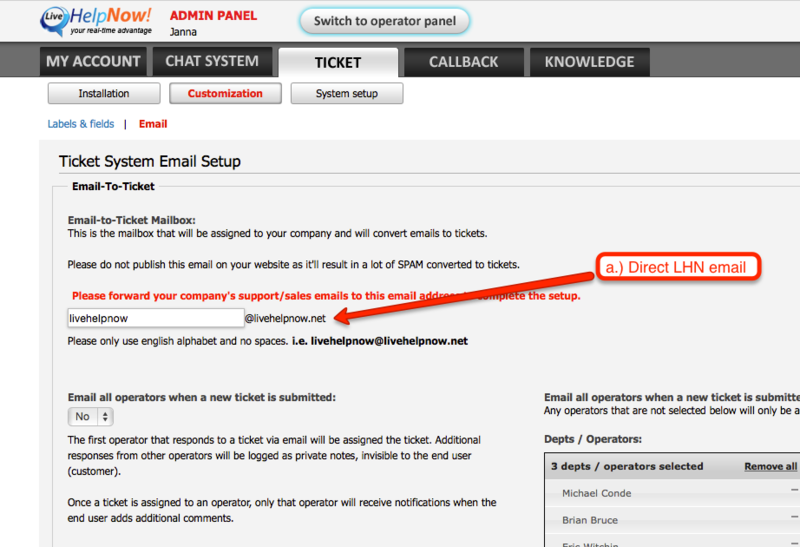 “Email-to-ticket Mailbox”- this is your email address at LiveHelpNow, i/e yourcompany@livehelpnow.net. LiveHelpNow monitors this account for you and will convert all your email communications into ticket inquiries. We recommend forwarding sales and support emails to this email address to allow you to use your company email address instead of the direct livehelpnow email. “eMail Profile”- This will give you the options to use your default email (which you can fill out manually- OR create a Mail Profile that allows your communications to come from your own personal email address (i.e gmail, yahoo, hotmail etc. or your own custom service) so that your communications are personalized. To configure your mail profile and email templates please go to Admin Panel » Ticket System » System Setup » Ticket Categories/Email Templates and select a template to edit or click "Create New Category". How do I create and setup a mail profile? IMPORTANT: Think about this 'Email Account' as a distribution account, so please make sure that this email account is not setup in Outlook, not monitored by any staff member and not configured to be used anywhere else in your LiveHelpNow account (Account contact email or Operator email), so it would be a good idea to have this email account created just for your email-to-ticket process. Q: I have 4 operators and all receive email notification of a new ticket, what happens when all of them reply via email and not in Operator Panel -> Tickets tab? Q: How do I close a ticket? A: If customer email or reply has attachments they will also be attached to the ticket. Q: What happens when customer replies to the ticket update email? A: Customer comment will be added to the ticket and the operator assigned to the ticket will be notified of the update. If ticket is in "closed" status, it'll be re-opened automatically.